Study Abroad: Where will your degree take you? 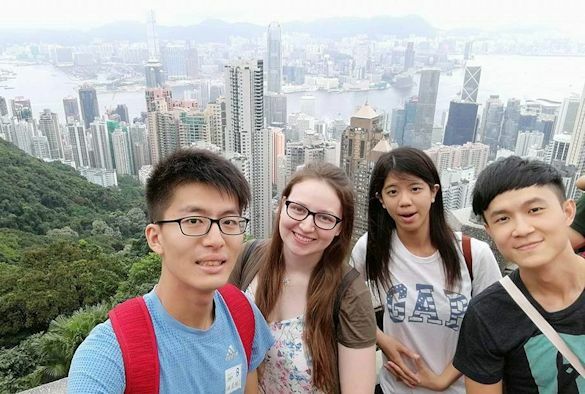 University of Liverpool student Rachael Elliot (Second from left) studied at the International Summer School at the Chinese University of Hong Kong last year. Did you know that with your Liverpool degree you can see the world, discover amazing new cultures and make lifelong friends from across the globe? All students are invited to attend the Study Abroad Fair on 30 October to find out more about the opportunity to spend time studying at one of our worldwide partner universities during your Liverpool degree. This year’s event is expected to be bigger and better than ever before as the brand new Summer Abroad and Year in China for final year students opportunities are launched. Students attending the Fair will be able to speak with those who have previously studied abroad, discover our 100+ partner universities around the globe, talk to Academic International Opportunities Advisors and attend information sessions led by the Study Abroad Team. By attending the Fair you will also be eligible to enter a prize draw with the top prize being a £250 travel voucher courtesy of Student Universe. You can explore opportunities in advance of the Fair by visiting the Study Abroad webpages.